Keep regularly scheduled cleaning appointments and screenings. Doing so GREATLY increases the likelihood that any problems will be detected early. It’s worth it. In addition to a visual and palpable oral exam we have been using a screening device for a number of years called the VELscope. The VELscope exam only takes a few minutes to perform. It is a handheld tool that emits a safe blue light that provides an effective means of differentiating between normal and abnormal tissue. 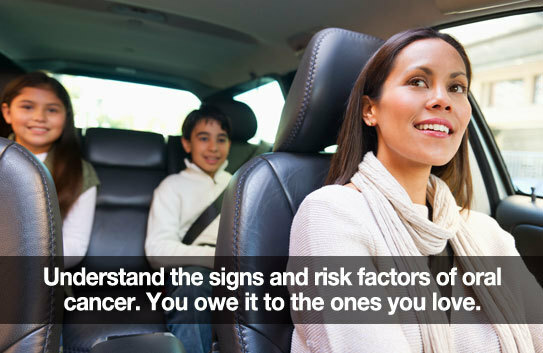 As with any cancer, early detection and treatment offer the best opportunity for satisfactory results. As your trusted, lifelong oral health partner, we want to keep you and your loved ones as healthy as possible. Let us know if you have questions about oral cancer or any of the symptoms mentioned above. And share this information with someone you love!